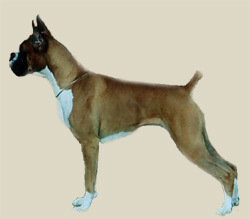 The Boxer"s body is compact and powerful and the shiny, close-fitting coat comes in fawn, brindle, white and various shades of red, with white markings. White Boxers cannot be registered with some Kennel Clubs. The tail is usually docked. Ear cropping is optional. Docking and cropping is illegal in some countries., Its head should be in proportion to its body, lean and unwrinkled. Its lower jaw extends beyond its upper one, curving upward. Neither teeth nor tongue are to show when the mouth is closed. The nose is large and black with very open nostrils. Eyes dark. The neck should be round, strong, and muscular, without dewlap. The body should be square. The tail is carried high. Its front legs should be straight and parallel. The Boxer"s smooth, short-haired coat is easy to groom. Brush with a firm bristle brush, and bathe only when necessary, for it removes the natural oils from the skin. Boxers are very clean and groom themselves like cats. This breed is an average shedder.